"OST Vol 3" is now available at bombarded.bandcamp.com and includes selections from the backing tracks that Spurrier composed for episodes 21-30 of the show. Feel free to use them in whatever game you're playing, or just jam to them whenever! We hope you enjoy and thanks for listening! The bards have parted ways to rescue the person in the cafetorium...or steal hair? Who really knows anymore. Hopefully they can bring it all together in the end! OST Vol 3 is going to be released next week on April 16th! Also, if you haven't checked it out yet, Chaos Sauce Vol 3 is out right now at bombarded.bandcamp.com, so head on over to pick those up if you'd like. Thanks for listening! Hey everyone! We just wanted to let everyone know that Chaos Sauce Vol 3 is now available at bombarded.bandcamp.com for your listening enjoyment! You can stream it or download it for free (or send a few bucks our way if you're feeling it), so head on over and check out those tunes! Episode 34 will be dropping next week on April 9th, and then the OST Vol 3 will be releasing the following week on April 16th. The bards have found themselves inside Kage’s workshop and quickly find out that there’s a lot more than they had bargained for inside. Also, Chaos Sauce Vol 3 is dropping next Tuesday, April 2! So be on the lookout for that on the bandcamp. Thanks for listening! If you're curious as to what goes into the making of bomBARDed, how we come up with the songs for each episode, what our favorite sandwiches are, and the answers to a plethora of other questions, then check out this mailbag special, "BomBARDed: Unplugged!" We answer a bunch of musical questions as well, and we also demo how we go about creating the songs for the each episode at the end of the show. We had a TON of fun answering everyone's questions, so check it out! Otamatone example: "Never Gonna Give You Up - Otamatone Cover"
The bards are at Wesley’s whim, and unlike Conway, there’s no telling what he has in store. CW: Some Slightly Graphic Wildlife Content/Depictions of Nature at 37:30-38:30. Don't forget to email us any questions you have for our mailbag episode, "BomBARDed: Unplugged" on our contact page. That episode will drop in two weeks on February 26. Thanks for listening, everyone! Happy New Year, everyone! In this episode we recap the past 20 episodes with a rap, talk about some plans we have for the future and also talk about our favorite moments from 2018. You can also let us know your favorite bomBARDed moments from 2018 on twitter by using #bardcast2018, and you'll be entered to win a signed print of the Chaos Sauce Vol 2 album art! Also, below are the podcasts that we were guests on in 2018 if you'd like to give those a listen as well. Hope everyone has an awesome 2019 and Episode 29 will be out on January 15. Talk to you then! The bards branch off the road into the Discordant Fields. You won’t beleaf what they find! 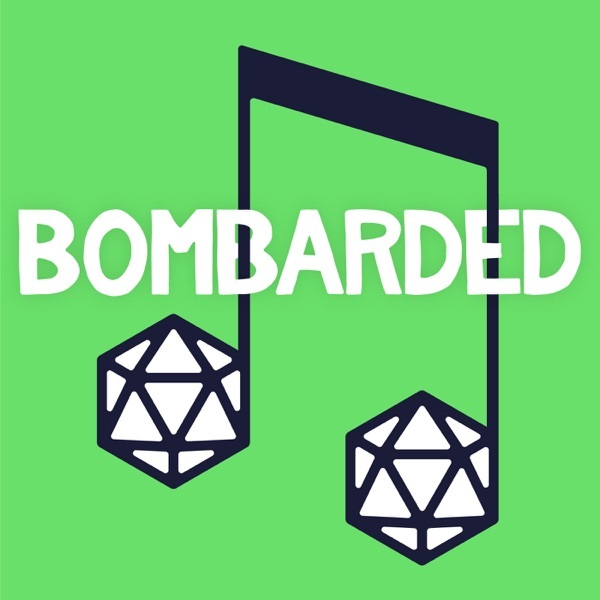 When bards hit the road, they write traveling tunes on their journey, and that's exactly what we did in this special edition of BomBARDed! We set out from Texas to GEXCon in Virginia this past September, and we chronicled our trip by writing and recording a song for each state we passed through along the way (six songs in all). So buckle your seatbelt, grab your snacks, and sit back and enjoy some bards on board as we play our way across the country! Don't forget to check out all of the music we have made for the show at http://bombarded.bandcamp.com and for even more BomBARDed, you can visit http://bombardedcast.com. We're also doing a giveaway next episode, so tune in for details on how to enter! The bards are in Greenspire’s office again, but this time for an entirely different reason. Something about choosing a bard college to specialize in and learning new skills? What could Strumlott have in store for Chaos Sauce? Tune in to find out! Chaos Sauce Vol. 2 is going to be released next week on September 18 on bombarded.bandcamp.com, so be sure to check that out when it drops! The bomBARDed OST Vol. 2 is also in production, and we will be releasing that on October 2. Huzzah! Bed Races! Time Signatures! Hair! Stargazing! More Hair! The bards learn some new ways to get with the beat and have some serious fun in some of the other activities at Strumlotts. School Spirit! Bard! Fight! Win! Again, we're all going to be at GEXCON on September 1st, and here is a rough schedule of what we're going to be up to: Kyle's DM'ing a one-shot at 10am, we're all going to be doing a panel at noon, and right afterwards at 1pm we're going to host a meet and greet for anyone who'd like to come and say hi! For up-to-date info, follow us on social media at @bombardedcast and check out GEXCON's website. Cya there! Also, Chaos Sauce Vol 2 is going to be released on Sept 18, and the bomBARDed OST Vol 2 is going to be released on Oct 2! Huzzah! Ep. 17 - Oh No You Squidn't!